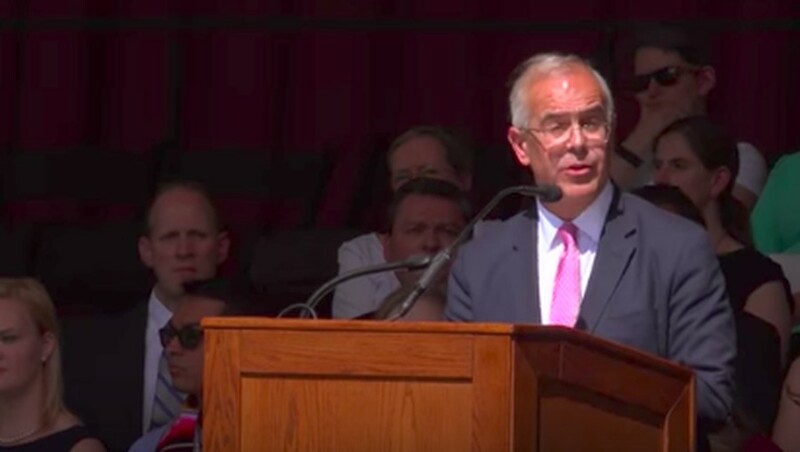 New York Times columnist David Brooks (A.B. ‘83) spoke to the graduating Class of 2017 on Friday, reminiscing about his experience with the Core and telling students they need to learn intimacy. A conservative political pundit, Brooks worked for The Washington Times, The Wall Street Journal, and The Weekly Standard before joining The New York Times. At UChicago he majored in history and wrote for the Viewpoints section of The Maroon. He said that because of his education here, “I longed to know how to see,” and conjectured that “the whole disaster of the Trump presidency is because of a breakdown in intellectual virtue,” and with it Americans’ ability to see clearly, to which the audience applauded. “There wasn’t enough dancing or drinking or any of the activities that make diffidence possible,” he said. Brooks’s speech was part of the University’s inaugural Class Day ceremony. In addition to his speech, graduating students Liz Adetiba, Karyn Peyton, and Alex Morales spoke. This year’s Quantrell Awards for Excellence in Undergraduate Teaching were then presented to Andrew Abbott (sociology), Agnes Callard (philosophy), Bana Jabri (biomedical sciences) and Scott Snyder (chemistry).